Been awhile since we had a spot of Australia Cycle Chic. Here's a shot from the Cycle Chic group on Flickr by Velovotee taken in Sydney. If you're down under and looking for restored vintage bicycles, check out our friend Lucy's eBay page to see if you can find your dream bicycle. 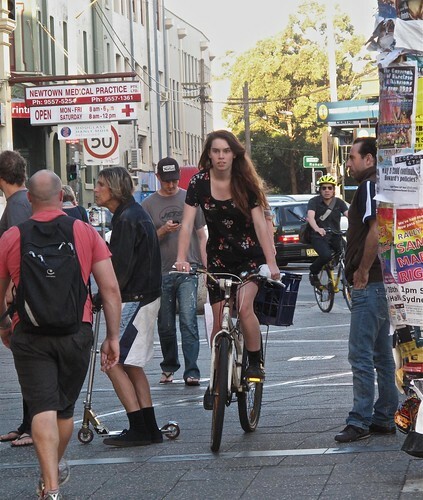 Nice to see the noble Sydney milk crate bike basket on your website! Nice to see Australians ignoring their helmet law. loving the little scooter.. i hint of hillary swank? Love the expression of disbelief from the yellow helmet behind her and also how she seems to be invisibly passing others.